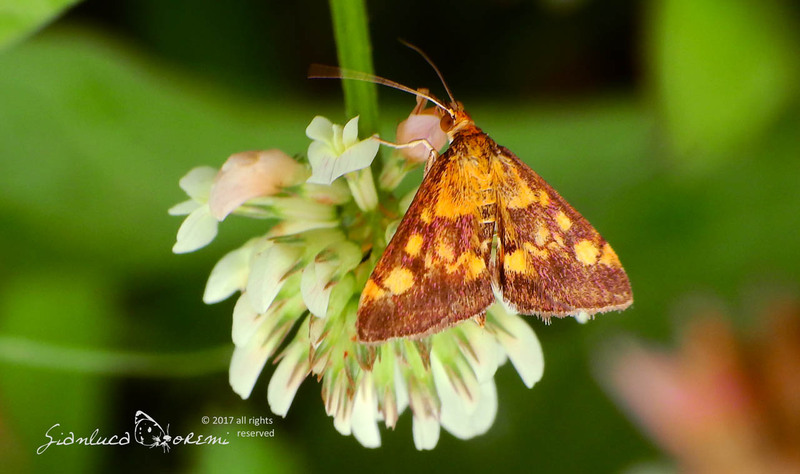 The mint moth (Pyrausta aurata)is a moth of the family crambidae widespread in Africa, Asia and Europe. 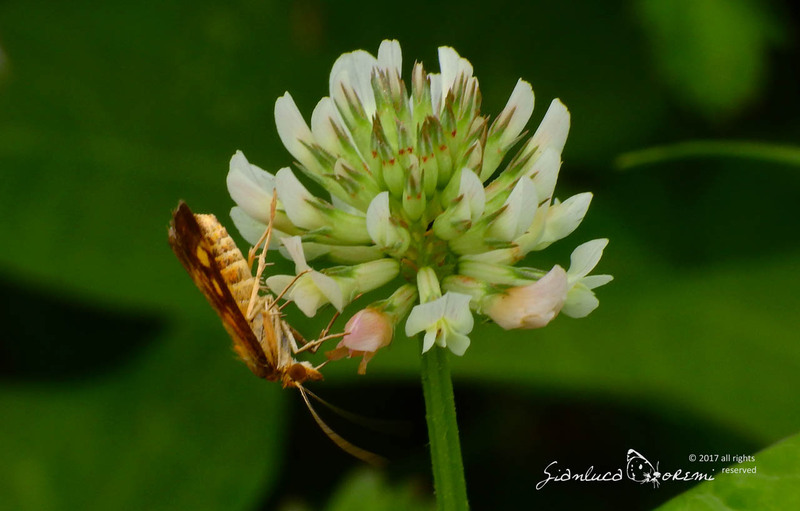 It has a wingspan of 17-20 mm. It is a bivoltine species, sometimes trivoltine primarily active in the day but you can observe even at night when attracted by artificial lights; in the case of three generations two of these are superimposed. The adults can be seen in flight from May to September depending on the latitude. This species is often confused with Pyrausta purpuralis. Both can have a bright purple color with golden spots, especially when they are , or brown with yellowish spots when worn. The main feature is the arrangement of markings postmediane front wing. On Pyrausta aurata the only sign postmediano constant is a golden spot roundabout near the coast, but there is usually another small golden sign between it and the coast. In the samples just out of the cocoon, there is sometimes an indistinct wavy line postmediana golden, between the spot and round the back. On Pyrausta purpuralis markings postmediane can form a broad continuous band, but they are usually divided into three spots substantial. 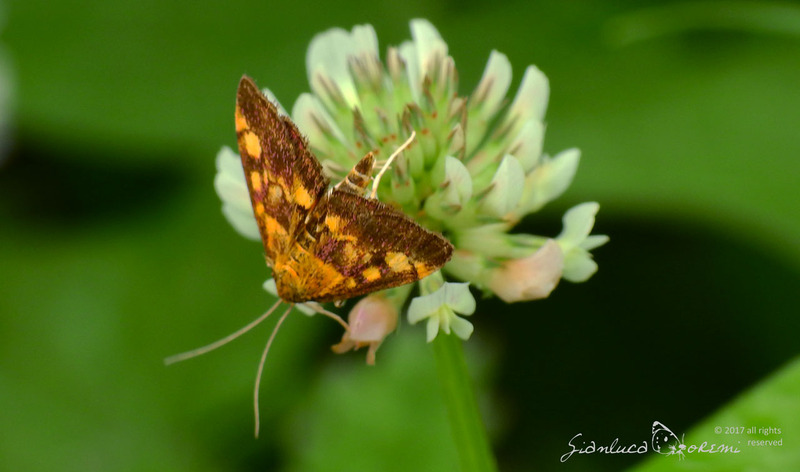 The spot near the back is always much larger than that found on Pyrausta aurata, and turns to the base of the wing that comes close to the dorsal edge. Habitat are Grassland limestone glades Forest, Gardens and Cave. 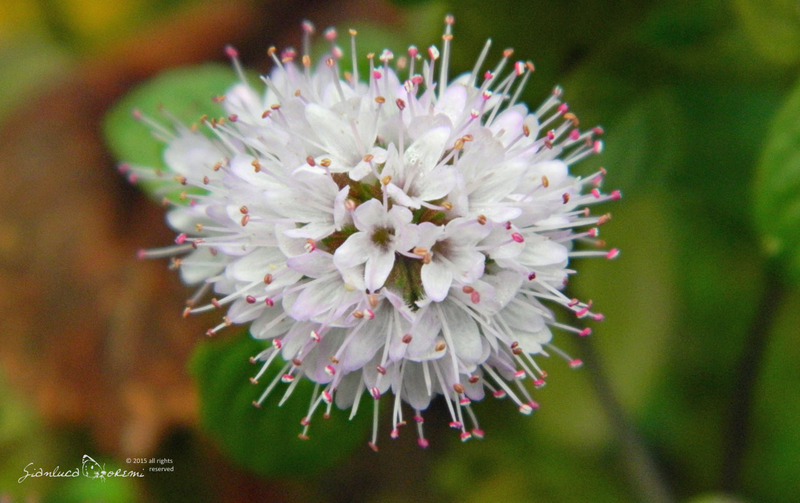 The larvae feed on mint (Mentha spicata), (Mentha rotundifolia), marjoram (Origanum vulgare), (Salvia pratensis), Melissa (Melissa officinalis) catmint (Nepeta cataria) and calamints (Calamintha spp), on the underside of the leaves before the flowers to feed within a network.